Daniells visited India in 1784 with his ten year old nephew William. During this period the power of the East India Company had greatly increased and the British were controlling Large areas of the subcontinent. Although Mumbai was still enclave confined to a group of marshy islands. Calcutta was an administrative center of a great tract of land that extended upcountry to Oudh. In the south inspire of periodic confrontations with the relers of Mysore, Madras was dominated to a considerable area and had good relations with the rulers of carnatic and Tanjure. For an Englishman it was difficult to travel freely and rely on hospitality from his countryman. Daniells was primarily a landscape painter at which time most British artists concentrated on portrait painting thus he did not find any patronage back home in Britain. His extensive work on the Indian Raj not only focuses a very intimate detail of the subcontinent but also immense nostalgia. 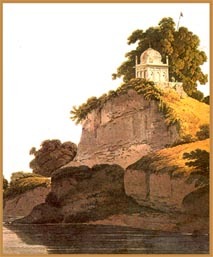 CC R052 - Near Currah on the river Gange (1, Oriental scenery, 21) Thomas Daniells 1788. In this aquatint Thomas Danialls catches the great beauty of the Ganges in the cold weather with its smooth surface and big banks which in the rain crumble and fall into the stream. He was interested in the little shrine which be says although built for the worship of Hundo idols it is almost wholly in the Mohammedan style of design " This was painted on 20th December 1788. CCRO53- Raje Gaut the Principal Road up to Rotas Ghur, Bahar'' (1, 0riental scenery, 5 ) Thomas Daniells, 1790. Panited in February 1790, Rotas Ghur is the most considerable hill fort in this part of india. Sher Shah Sur captured Rohtasgarh from ruler in 1539. It was eventually surrendered to the British in 1764. CCRO55- The waterfall at Puppanassum in the Tinnevelly District" (IV, Twenty four landscape 2), Thomas Daniells 1792. This painting was made in August 1798. this magnificent cataract is held by Hindos in great veneration and is accordingly visited by innumerable devotees Nothing can be more grand and impressive than when on first throwing the gates this extraordinary scene bursts upon the sight ..... accompanied by a noise so treamendous that , comparatively all other sounds are but whispers". CCR054 - "View of Ellora Caves", Thomas Daniells. This shows the view of the Ellora Caves looking back towards the entrance from the main cave temple.